Schine was hired by Senator Joseph McCarthy and his special counsel Roy Cohn as an investigative staff member. 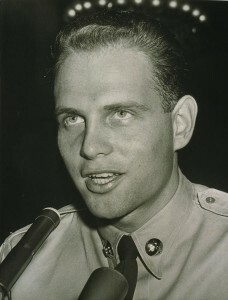 McCarthy and Cohn’s illegal efforts to secure Schine preferential treatment after he was drafted into the army became a focus of the ArmyMcCarthy Hearings (1954), which were seen by some 20 million television viewers. Schine became a household name in a scandal intensified by a rumored homosexual relationship between him and Cohn.